Parathyroid Cysts: Lots of Hyperparathyroid Symptoms From Small Parathyroid Cysts. Our patients come from all over the world. Some are your neighbors! We made the Calcium Pro app to make high calcium and parathyroid problems easy to diagnose. Top-3 medical app of 2014, 15, and 16. Our surgeons are in top 1% of all surgeons in the U.S. Interesting stories about hyperparathyroid patients we see every day. There are some great stories here! Read the stories of over 2,000 people who had parathyroid surgery at the Norman Parathyroid Center. Parathyroid cysts are uncommon, but can cause lots of symptoms of hyperparathyroidism sometimes, and no symptoms at all at other times. Cysts are fluid-filled sacks. Parathyroid cysts, therefore, are fluid-filled sacks that are growing out of one of the parathyroid glands. Parathyroid cysts are rare, occurring in about 1 out of 200 parathyroid operations for hyperparathyroidism. We perform about 210 parathyroid operations per month, and we see a parathyroid cyst only about once every four weeks. A surgeon who performs parathyroid surgery even twice a week will encounter a parathyroid cyst only once every 3-4 years. That is why you want an experienced parathyroid surgeon so they can do the right thing! Huge parathyroid cyst (bigger than a lemon) shown behind the carotid artery (C) and thyroid (T) in a 56 year old woman. These cysts are full of huge amounts of parathyroid hormone (PTH). Parathyroid cysts are always filled with a crystal clear fluid that is full of parathyroid hormone (PTH). If you stick a needle into this fluid and measure the amount of parathyroid hormone, the level will be into the thousands (about 2,000 to 4,500 pg/ml PTH). Of the 50 or so parathyroid cysts that I have seen over my career, most are just over 2 cm (3/4 inch) in size. This parathyroid blog was prompted by a 56 year old woman pharmacist from Seal Beach, California that my partner Jose Lopez and I operated on this week. This cyst was over 6 cm in size (about the size of a lemon). The ultrasound that I performed on her is shown here (we perform ultrasound on everybody in the operating room to evaluate the thyroid for thyroid nodules or other thyroid problems that we need to address while we have the thyroid exposed during the parathyroid operation). The Parathyroid Cyst is shown by "PC", "C"=Carotid artery, and "T" = Thyroid. You can see the parathyroid cyst is much bigger than Susan's thyroid! We tried our best to remove the parathyroid cyst without breaking it, but as you can see from the second photo, the cyst wall is very thin (often only 1 cell thick!). It was not possible to remove the cyst without it breaking and spilling all the high-PTH fluid into her neck… so we simply stuck a needle into the cyst and drained the fluid. This made the cyst MUCH smaller allowing us to remove it completely intact. 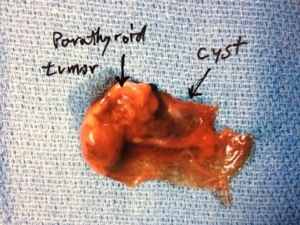 Parathyroid cyst demonstrating that part of the cyst is made up of a parathyroid tumor (adenoma), with a large, thin sack attached which has been broken. The thin-walled sack is the cyst, which is full of PTH fluid. Parathyroid cysts cause symptoms of hyperparathyroidism in some people all the time just like classic parathyroid tumors. However, in about half of the people, the symptoms of a parathyroid cyst are intermittent. These patients will have terrible symptoms of high calcium (depression, fatigue, muscle cramps, bone pain, etc) for a few days, every month or two when the cyst gets too big and breaks secreting its fluid into the blood stream. The symptoms last for a few days while the PTH and blood calcium are very high, but then subside as the cyst starts to grow and fill with fluid again. In men, the symptoms can sometimes start about 2 hours after shaving, when they are putting pressure on the parathyroid cyst causing it to ooze some of its very high PTH containing fluid into the blood stream. We've seen several men who were "fine" until about an hour after shaving when they "fainted" and became unresponsive… and when taken to the emergency room were found to have nothing wrong with them except a very high blood calcium level! They put pressure on the cyst causing it to break and release high amounts of PTH into the blood! Parathyroid cysts are almost never seen on sestamibi scans because the sestamibi drug used for the test must be absorbed by the parathyroid tumor cells-the fluid doesn't take up the dye so you can't see it. As you know from reading our other blogs, scans are WAY over used, and far too much emphasis is put on sestamibi scans. This is another example showing that sestamibi scans will not be positive even though the patient has primary hyperparathyroidism. These patients must have an operation to remove a parathyroid tumor even though the scan is negative. This is another reason why we tell patients and doctors to "Stop getting scans!". Scans are wrong more than they are right; even when positive, a sestamibi scan is wrong almost 60% of the time. When negative (like it will be with all parathyroid cysts), sestamibi scans are wrong 100% of the time. 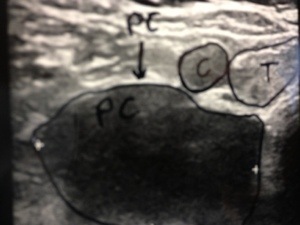 Ultrasound is a great test for parathyroid cysts… IF the cyst is present! Remember, if you have symptoms of a parathyroid cyst and go to the doctor when you have symptoms, an ultrasound will NOT show the cyst because the cyst has released its fluid and has collapsed (causing the symptoms). You can typically find a parathyroid cyst on ultrasound when the cyst is full of fluid, and usually this is when the patient has no symptoms. In summary, Parathyroid Cysts are uncommon if not rare, and most surgeons have never seen one. They often cause symptoms of hyperparathyroidism intermittently, and almost never show up on sestamibi scan. Parathyroid cysts should be taken out when found, without exception. There is never a reason to "watch" or "observe" a parathyroid cyst-they will ALL cause problems and should ALL be removed regardless of their size. The diagnosis of a parathyroid cyst is one of the ONLY times when sticking a needle (biopsying) a parathyroid gland is acceptable (read our other blog discussing that sticking needles into parathyroid tumors should never be done). Read more about the symptoms of primary hyperparathyroidism. James (Jim) Norman, MD, FACS, FACE, is recognized as one of the world's foremost expert on parathyroid disease and hyperparathyroidism and has treated far more parathyroid patients than any other doctor in the world. He is the founder of the Norman Parathyroid Center in Tampa, Florida, the world's leading center for the diagnosis and treatment of hyperparathyroidism. Dr Norman has made numerous contributions to to the understanding of parathyroid disease and is credited with dramatically changing the way parathyroid surgery is performed. He is a fellow of the American College of Surgeons (FACS) and also a Fellow of the American College of Endocrinology (FACE). He is recognized in the top 1% of all surgeons by US News and World Reports in addition to dozens of other awards and Best Surgeon accolades. He has published over 250 peer-reviewed journal articles. Dr Norman and his partners perform more than 3,300 parathyroid operations annually on patients from all over the world. Parathyroid.com is an educational service of the Norman Parathyroid Center, the world's leading parathyroid treatment center performing over 4020 parathyroid operations annually (average 79 per week). Get the Calcium-Pro parathyroid analysis app developed by our experts. 5-Star-Rated, award winning app helps diagnose hyperparathyroidism. Thyroid Questions? Visit our sister website ThyroidCancer.com for our sister center: the Clayman Thyroid Cancer Center. Enter the email addresses of the people you want to share this page with. Thank you for your question(s), they have successfully submitted and we will respond as soon as we can. We know there is a lot of information on the site and it can be hard to take it all in. If you have a question for one of our surgeons, or for our office, we would be happy to help. Let us know your question(s) and we will forward it to one of our surgeons, or to our office, and get back to you as soon as we can.